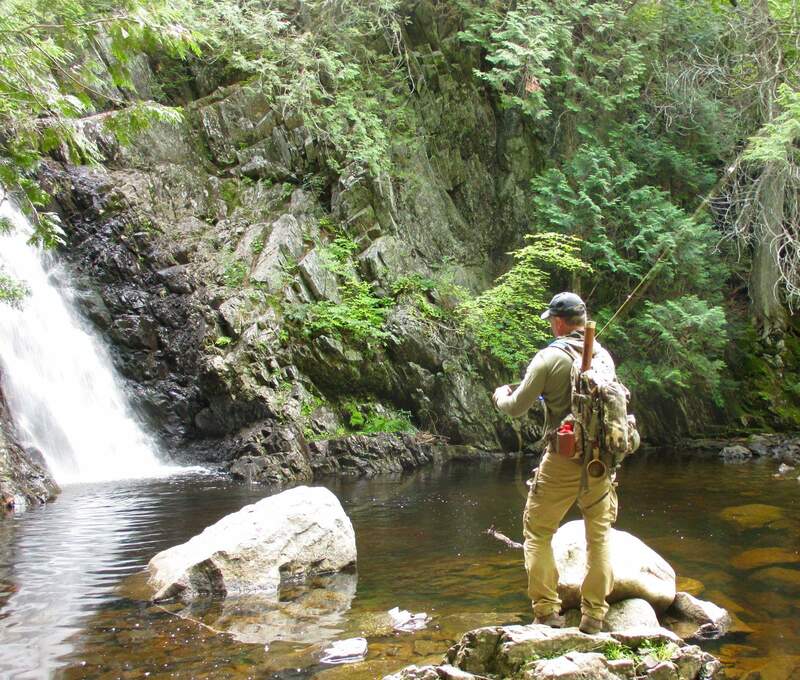 Some of the best fly fishing in Maine is conveniently located a short walk from Grand Falls Hut. Situated above the banks of the Dead River, Grand Falls is renowned for its trout. Before any fishing trip, be sure to secure your fishing license. Maine Huts & Trails is proud to partner with Four Peaks Guide Service for one of a kind fly fishing trips suitable for all abilities. Guided trips are available along Poplar Stream for native brook trout fishing. The main stem of the Dead River begins at the outlet of Flagstaff Lake, not far from Flagstaff Hut. It flows for 20 miles before entering the Kennebec River at The Forks. Grand Falls is located about 6 miles below the dam, and separates the river into two distinct sections. The upper river is often referred to as Grand Falls Flowage and is deep and slow moving. This area is best known for its rainbow trout, often reaching over 20 inches. This is a naturally reproducing, local population that probably began from an illegal stocking years ago. The density of rainbows isn’t high here, but they grow well on the smelts that wash into the river from Flagstaff Lake. Along with the rainbows, brook trout and salmon are also found in Grand Falls Flowage. Most fishing occurs within one mile of the dam where anglers can wade the riffles in the vicinity of the Big Eddy. You’ll want to use a boat to fish the lower part of this flowage. Small spoons and Rapalas account for many of the larger fish that are taken in the spring. Smelt-imitating streamers like the Grey Ghost, Black Ghost and Thunder Creek are also popular here. Below Grand Falls and within easy walking distance from Grand Falls Hut, the lower river provides anglers with nearly 15 miles of riffles and pools to explore. The section of stream from Grand Falls to Spencer Stream is catch and release only, and is home to a dense population of trout and salmon. Access is limited to a handful of places where a road extends down to the water; those looking for solitude will find it on the middle section of the lower Dead. Areas that are easier to reach like Grand Falls, Spencer Rips and Poplar Hill Falls get much more fishing pressure. Most fishing on the lower river is for wild brook trout and salmon with an occasional rainbow, brown trout or splake (from Wyman Lake) mixed in. Generally, fish don’t get as large here as on the upper river, but there are always exceptions. Since the lower Dead runs warm in the summer, salmon are often found near the mouths of cool inlets like Spencer Stream or Enchanted Stream. Fish also congregate around spring seeps located on the bottom of some of the larger pools. Spin fishing with artificial lures is legal here, but many anglers like to float nymphs, small streamers or wet flies through the good-looking pools and riffles. Dry flies become popular once the hatches begin in mid to late May and fish are caught here on everything from grasshoppers to elk-hair caddis.